I am using the Atmel AT32UC3C2512C and looking into the datasheet there are two kinds of PWM modes: Center Aligned and Left Aligned. I would like to know when one is supposed to use each one of these modes, and pros and cons of them. The advantage of symmetric PWM thus is better utilization of applied power, with less power wasted on undesired harmonics. Disadvantage 1: Slightly more complicated PWM generation mechanism when using timer/counter overflows. It is simply easier to count down and reset-at-zero a timer determining duty cycle to change PWM state, and set (start) the timer based on another timer at the PWM frequency. This gives left aligned PWM. The first disadvantage may be moot as many modern microcontrollers have symmetric PWM mode built into their PWM modules, so the programmer does not need to do much extra. 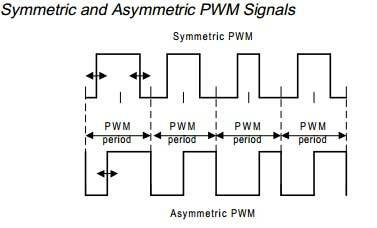 For very harmonic-sensitive purposes, such as control of sensitive motors and actuators, the lower harmonic overhead of symmetric PWM is critical. Not so for heating or lighting purposes. It is surmised that the leading or trailing edges of all LEDs on such displays being synchronized causes some people to notice flicker in a moving visual far more than if the edges were to be offset as per intensity of each LED, as happens with symmetric PWM. Not the answer you're looking for? Browse other questions tagged avr pwm atmel or ask your own question. AVR Timer for PWM and interrupt? Why change microcontroller's PWM frequency?